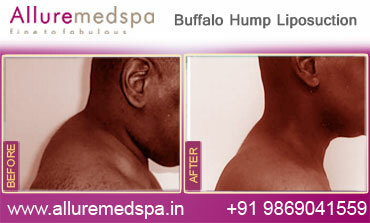 Buffalo Hump is a fat deposited under the skin in the upper neck and back area. It is also known as the Dorsocervical fat pad. The Buffalo Hump can lead to contour deformities. During severe cases, it can even limit the person to extend their head and neck. Some form of diseases such as Cushing’s and other diseases are the reasons for causing buffalo humps. Prolonged use of certain steroids such as prednisone, cotisone, hydrocortisone; extreme obesity can cause the buffalo hump. The buffalo hump tissue is composed of fibrous fatty tissue that can be painful and is firm to touch. The good news is that the buffalo hump can be treated and you can be free from this distress forever. 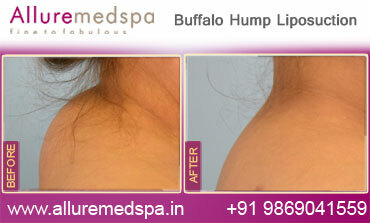 The buffalo hump liposuction can dramatically reduce the hump from the back of your shoulder. Based on your clinical consultation with your Cosmetic Surgeon Dr. Milan Doshi at Liposuction Center- Alluremedspa, various modalities of liposuction will be suggested. A well experience surgeon like Dr. Milan Doshi will be able to employ various possibilities and risks involved with the liposuction. The most commonly used form of Liposuction are ultrasonic liposuction, laser-assisted liposuction, laser-assisted liposuction, Tumescent liposuction, Vase Liposuction, and power-assisted liposuction. Based on your body type, age, and other health woes, Dr. Doshi will suggest you the process of the surgery. If the area is quite large, the Vaser Liposuction will be conducted. In the process, a small probe is made through a incision between the layer of the skin and muscle area. At Alluremedspa, local anesthesia along with a saline solution is infused into the area to be traded. The saline substance resonate at high frequency emitting sound waves that breaks away the excess fat cells in the area. The fat cells is suctioned out by inserting a cannula in the area giving optimal body sculpting. The main benefit of this Liposuction is that the result is quicker and the side effects are minimal. The discomfort is usually mild and with intense care and medications, the pain and soreness will dramatically reduce in a matter of certain weeks. After undergoing this surgery, you can lead a comfortable life and patients who have lost sense of motion can now walk in a perfectly upright manner. Allure MedSpa which is renowned for its state-of-the-art internationally acclaimed services,offers affordable and cost effective cosmetic procedures. To know more about the cost of your procedure request a consult by filling the form below. Your consultation is your chance to ask questions about Buffalo Hump Liposuction studies and put your mind at rest. Your surgeon will be able to offer you full explanations and answers to all of your queries. I have a strange problem. The back of my neck area is heavy and have been deposited by lots of fats. Therefore, it gets really difficult to even raise my head. I sometimes suffer from back ache and neck pain. 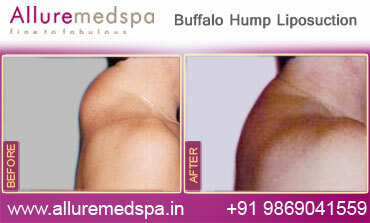 I have even checked with the doctor and they have suggested me to undergo buffalo hump liposuction procedure. The procedure will help you to get rid of the hump. The surgeon will remove the excess fat that has accumulated in the area and stitch the tissues to give you a tighter, firmer look. The procedure is quite costly in the region where I stay. Therefore, I was searching for something which will be more affordable for me. I came to know about Dr. Milan Doshi and his clinic Allure Medspa. I have heard a lot of good things about the clinic and Dr.Milan Doshi. I arranged for a call with Dr. Milan Doshi. I must say I felt really comfortable talking to him. My confidence has risen after talking to him and even my fear of surgery is gone. For surgery, I made my tickets to India. I landed here and went to the clinic. The surgeon evaluated my body and I was sent to the surgical room. The surgery took few hours and I was covered with bandages and had to stay in the hospital for a day or two. It’s been 4 months after the surgery and my hump is completely gone. I am happy now. What is Buffalo Hump Liposuction Surgery? The surgery will take only couple of hours and you will have to stay at the hospital for a day or two. Based on your clinical consultation with your surgeon, various modalities of liposuction will be suggested. A well experience surgeon will be able to employ various possibilities and risks involved with the liposuction. The most commonly used form of liposuction is ultrasonic liposuction, laser-assisted liposuction, laser-assisted liposuction, tumescent liposuction, Vase Liposuction, and power-assisted liposuction. Based on your body type, age, and other health woes, your surgeon will suggest you the process of the surgery. If the area is quite large, the Vaser Liposuction will be conducted. In the process, a small probe is made through an incision between the layer of the skin and muscle area. The local anesthesia along with a saline solution is infused into the area to be traded. The saline substance resonates at high frequency emitting sound waves that breaks away the excess fat cells in the area. The fat cells are suctioned out by inserting a cannula in the area giving optimal body sculpting. When the sutures are removed after the surgery? The sutures are usually removed within a week of the surgery. However, you should take special care of yourself after the surgery.